…abordar con el mayor detenimiento y objetividad posibles la evolución en la última década de una de las economías menos estudiadas—aunque no la menos interpretada—de América Latina. En particular, se tuvo el propósito de presentar al gobierno de Cuba y a la comunidad internacional un análisis independiente del desarrollo económico del país…..
My comments on the volume will concentrate on tourisn, a sector that commands its own chapter. The chapter on tourism of the CEPAL volume covers the development and performance of the tourism sector during the last decade. The chapter is divided into four sections: Institutional Organization; Basic Tourism Data; Tourism Trends; and Conclusions. Rather than discuss each section in turn, I will concentrate on the areas that I find most interesting or most troubling. These include: (a) description and analysis of tourist expenditure data; (b) the weight of tourism within Cuba’s aggregate economic accounts; and (c) the discussion on the linkages, import substitution and the import component of tourism. The real economic importance of international tourism lies in its ability to generate benefits for the host country; improve the balance of payments; generate government revenues; create income and employment; and promote economic growth and development. These benefits are derived primarily through tourist receipts or exports, the influx of outside money into the economy. Estimating these exports is therefore a necessary first step for the analysis of economic impact. In its profile of the Cuban tourism sector, CEPAL dwells at length on tourist revenues and average tourist revenues per day, comparing their performance through time and to other Caribbean countries. I take issue with this analysis on a number of points. First, on the issue of international comparisons of tourist receipts, as I have argued elsewhere (Espino 2000), unlike international arrivals—which are relatively easy to account for—receipts from international visitors are hard to estimate. Though attempts are being made to standardize the methodology used around the world to estimate these receipts, estimating techniques vary from country to country. This makes a meaningful comparison of visitors’ receipts across countries difficult. Second, in the case of Cuba, the analysis of visitors’ receipts is complicated by the fact that data on two identifiable and distinct series of receipts are collected and reported by Cuba. The existence of these two series has been documented by a number of researchers (Martín Fernández 1988; Simon 1995; Espino 2000). • The first is a visitor receipts series that follows the recommendations of the International Monetary Fund (IMF) for the inclusion of tourist receipts in the Balance of Payments and includes visitors expenditures on lodging, food, entertainment, travel within the country and the like, but excludes international travel fares. • The second series refers to gross revenue, and it includes not only visitors’ receipts but also revenues from other activities related to international tourism, such as international communications, aviation and others. What else is included in this series is not exactly clear. While the two series exist since the early 1980s they are often reported interchangeably and in recent years the Ministry of Tourism (MINTUR) has been divulging and emphasizing the second, broader series. It is the broader gross revenue series that the CEPAL study compares to visitors’ receipts of other Caribbean countries (see Table 1), thus compounding comparison errors. The fact that these two series are often reported interchangeably has led to confusion among researchers and at times to overestimates of the growth rate of revenues, when a current statistic on gross revenue is compared to previous years’ data of the expenditure series. CEPAL seems to have fallen into this trap, using tourist receipts for 1990 and 1991 and comparing these to gross revenues in subsequent years. The annual growth rates are further overstated by the fact that for 1998,1999 and 2000, CEPAL used MINTUR’s projection of gross revenues and an unrevised gross revenues series (see Table 1). In recent years both official sources and international agencies have been publishing what seems to be historically revised series (Espino 2000). Third, using the gross revenue series in Table 1, CEPAL constructs two series it calls average expenditure per visitor and average daily expenditure (p. 512). CEPAL then analyzes the performances of this series through time and against other Caribbean countries. To get average expenditure per visitor, gross revenues is divided by number of visitors. The latter is divided by average number of overnight stays at hotels to arrive at average expenditure per stay (see Table 2). The first problem with these series arises from the use of unrevised gross revenue and average number of nights. In Table 2, I have made the proper corrections using revised gross revenue and revised average number of nights. But over and beyond the revisions and the inconsistencies and comparability issues discussed above, there are some serious problems with the CEPAL methodology and interpretations. • The series do not represent average expenditures. To get at a meaningful average expenditure series, one would have to start with visitors’ receipts and not gross revenues. • In the construction of their average expenditure per day series, CEPAL chose to use average nights at hotels rather than average length of stay. This makes absolutely no sense. As the CEPAL points out (see p. 511) not all visitors to Cuba stay at hotels. While average nights at hotels have been falling in recent years, average length of visit has been increasing throughout the nineties (see Table 3). These factors explain the divergence in these two series from the growing importance in Cuba of two types of visitors: those coming in cruise ships and yachts and those in family visits. While it is very unlikely that visitors in the first category contribute significantly to the series, the differences can certainly be attributed to the growing importance of family visits to the Island, an issue to which I will return below. It is unclear why CEPAL used the average nights series to construct their average daily expenditure. While tourists arriving by sea and those on family visits do not contribute to the average night series, their expenditures are included in the gross revenue series. Thus, the CEPAL methodology overestimates average daily expenditures. It also made the CEPAL average expenditure per day series post a recovery towards the end of the decade. 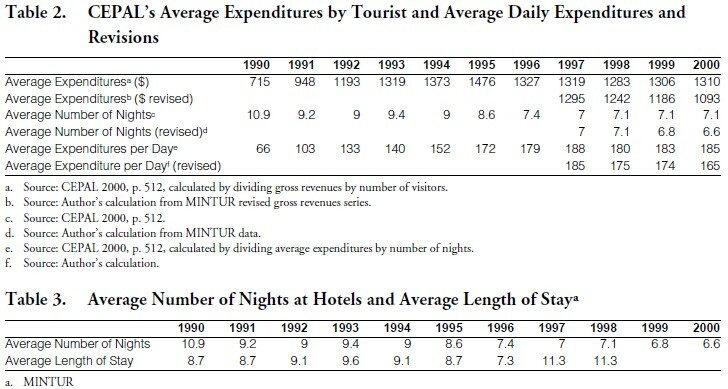 While the CEPAL average expenditure per visitor series shows a decline since 1995—because the average number of nights spent in hotels by visitors to Cuba has been falling throughout the decade—average expenditures per visitor day increases continuously until 1997, falling in 1998 and then recovering. The recovery disappears when revised average nights at hotels are used (see Table 2); using the latter instead of average length of stay would have accentuated the decline in the average expenditures per visitors series. Correcting for the problems in methodology still leaves the problems of interpretation. I have in the past constructed an average expenditure per visitor series using visitors receipts and visitors arrivals (Espino 2000). The series shows strong growth in international tourism receipts during the 1990s. Visitors’ expenditures (receipts series produced by the World Tourism Organization, WTO) grew from $443 million in 1992 to $1,741 million in 1999. From 1992 to 1995, tourism receipts grew at a faster rate than arrivals. This is reflected in average receipts per visitor, which increased from $962 in 1990 to $1300 in 1995 (see Table 4). Since 1995, however, average receipts per visitor have been declining and stood at $1069 in 1999. The average expenditure per day series accentuates the decline. Average expenditures per day reached a high of $161 in 1996 but fell to $95 in 1999. My estimate is that it did not surpass an average $88 in 2000. The fluctuations in the average receipts per visitors series, and their decline since 1995, might be due to a number of factors, among them change in expenditures per tourist, changes (increase and decreases) in prices, and inconsistencies in the tourism receipt series. Any meaningful interpretation on the performance of this series is hindered by the fact that Cuba’s official statistics aggregate the activities of two very different types of tourists: traditional tourists and tourists on family visits. As already hinted at above, these two types of tourists exhibit quite different expenditure patterns. Tourists on family visits do not stay in hotels and therefore spend less in lodging than the traditional tourist to the Island. They nevertheless tend to stay for longer and their expenditures have lower import component and more direct effect on the economy. Not all expenditures made by tourists on family visits, however, can be considered tourist expenditures; a large proportion of these expenditures should be considered family remittances (WTO 1995, p. 11). The increase in family visits in recent years has no doubt complicated the job of estimating tourist expenditures in Cuba. We would get a much better picture of trend in overall expenditures if expenditures by traditional tourist and expenditures by those on family visits where reported separately. Unfortunately they are not. Cuba does not even officially publish statistics on the number of tourists on family visits. There is evidence that in recent years visits from Cuban nationals on family visits have been increasing rapidly. These visits have helped Cuban tourist arrivals data stay close to projected levels. They also, however, have dampened average expenditures statistics. The CEPAL study provides estimates of the relative importance (weight) of international tourism on different economic aggregates: Gross Domestic Product (GDP), employment and balance of payments. I will comment on each of these estimates separately. La llegada de viajeros se encuentra todavía dominada por el turismo de paquete y debido a su estructura específica como parte de la economía del Estado, los movimientos de los viajeros pueden ser conocidos en el circuito monetario de divisas (p. 515). There is no discussion or analysis of the meaning of this contribution. For purposes of comparison, tourism’s contribution to Jamaica’s GDP has been estimated at 28 percent, in Bahamas at 33 percent, and in Antigua at 40 percent (WTO 1998, p. 71). Según estudios de diferentes especialistas y organismos internacionales en materia turística, se estima que por cada empleo directo se generan 2.7 a 3.0 empleos indirectos (p. 13). In other words the “multiplier” used has been imported from other sources. This introduces a serious flaw in the CEPAL estimates. I have argued elsewhere (Espino 1991, 1993, 1994) that the value of a multiplier varies from economy to economy and depends on a number of factors, such as leakages, linkages and supply constraints among others. Aside from the impropriety of using an imported multiplier I find the value of the multipliers used—2.7 for the direct to indirect employment and of 3.7 for direct employment from tourism to total employment—excessively high. Though tourist related employment data are hard to find, a study by the Organization for Economic Cooperation and Development (OECD) for industrial countries shows much lower values for multipliers (WTO 1998). In all countries studied, indirect employment from tourism was lower than direct employment from tourism, thus generating a value of less than one for the direct to indirect multiplier. Values for the direct employment from tourism to total employment from tourism multipliers range from a low of 1.3 for France, Belgium and Switzerland to a high of 1.7 for Spain. Trying to justify the high value of the multiplier it uses for Cuba, CEPAL argues that, “El efecto es desigual, porque presenta alto en los destinos turísticos emergentes y más bajos en los destinos maduros” (p. 515). 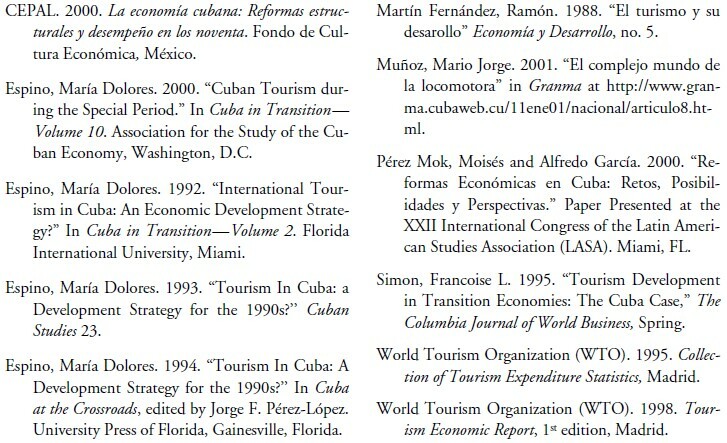 This argument however is not relevant to Cuba due to: (1) the amount of supply constraints; and (2) the fact that employment in construction related to tourism, which accounts for the high indirect tourist employment in areas with an emerging tourism industry, is probably already included in the direct numbers. Because of the difficulty in arriving at total employment in tourism number, in my on work I have only used the direct employment numbers (Espino 2000). Finally, the employment shares used by CEPAL are inflated because of the use of employment in the state civil sector as their denominator. In the changing Cuban labor market, the participation of the labor force in the state sector has been declining in the 1990s. 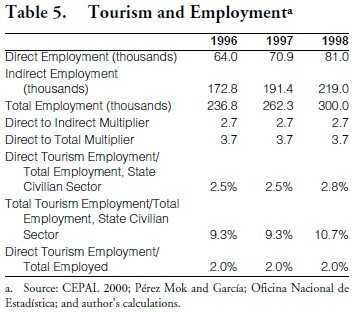 Using direct employment divided by the total number of persons employed in the civilian labor force (see Table 5), the percentage of direct tourism employment to total persons employed for 1996,1997, and 1998 remained at a constant 2% (Espino 2000). This share would be even lower if evaluated over total labor force, that is those employed and unemployed. In their analysis of the relative importance or weight of tourism on Cuba’s balance of payments, CEPAL correctly points out that tourism activity has become “of fundamental importance in generating hard currency for the country” (p. 516). While revised data would change somewhat the value of the contributions, it would not change the conclusions. However, CEPAL avoided the issue of the import component of revenues from tourism. That is, that the credits in the balance of payments related to tourism are accompanied by debits elsewhere in those same accounts. In tourism this is known as the import component, and includes such things as: the cost of imported goods and services used by tourists; the foreign exchange cost of capital investment; payments that leave Cuba in the form of profits, interest payments royalties, management fees, payments to foreign travel agents, and so on; and the cost of overseas training of service personnel. While no precise estimate of Cuba’s import component from tourism is available, official sources admit that it high and reducing it has been stated as one of the goals of Cuban economic policies (Espino 2000). When assessing the ability of export industries to generate foreign exchange, a more accurate measure would be net earnings, that is, gross earnings minus the associated import required to generate those earnings. It is therefore inaccurate and misleading for CEPAL to state that remittances from abroad amounted to 35% of tourism revenues (p. 515). Because remittances have practically zero import component, they might well contribute more in net terms to the balance of payments accounts than tourism. The data provided is mostly anecdotic and at times contradictory. Thus we are told that, “in only two years, the sales of many government entities to the tourism sector have more than doubled”(p. 535), but the data shown on the same page do not support the assertion. In the data provided, increases in sales to the tourism sector between 1995 and 1997 ranged from a high of 225.3% increase in sales by the Ministerio de Sideromecánica y Electrónica (SIME) to a low of 26.2% increase by the Ministerio de Agricultura. These growth rates are hard to interpret given that we are not given the level of base year sales, what percent of the increase is due to increase in prices, or what is the import component of these sales. There is one observation that certainly can be made: an increase of only 26% in agriculture’s sales to the tourism sector, while tourist arrivals grew 57% during the same time period, does not bode well for import substitution. One interesting piece of information cited by CEPAL is that the Instituto Nacional de Investigaciones Económicas (INIE) estimates that, on average, 44% (46% is reported by Pérez Mok and García) of all purchases made to service the tourist sector correspond to goods domestically produced. The percentage is reported to have been only 10% in 1990. The increase indicates improvement in import substitution, but does not give us the import component (or coefficient) of tourism. This is because, first, domestically- produced goods have their own import component and, second, as discussed above, the cost of imported goods and services is only one of the components of the import coefficient of tourism. A recent report claims that the in 1999, domestically produced goods made up 53% of all purchases by the tourism sectors, and that this percentage increased to 61% in 2000 (Muñoz 2001). The same report cites Ibrahim Ferradaz, the Minister of Tourism, stating that: “the cost of generating one dollar must be about 78 cents (as of data from the end of November), approximately the same results as those obtained last year.” This is the clearest hint as to a tourist import component given by a Cuban official in a long time. The Tourism chapter of the CEPAL report turned out to be mostly descriptive in nature, offering primarily a compilation of data that for the most part had already been available to researchers from other sources both inside and outside the island. Though at times it offers some interesting bits of informaiton, serious analysis is limited and some is seriously flawed. CEPAL promised a detailed, objective and independent study. For tourism, at least, the promise proved hollow.